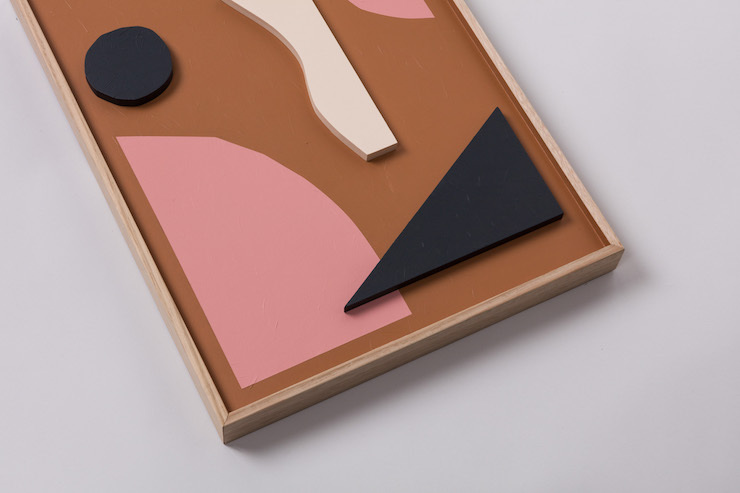 New abstract works by Spencer Harrison. 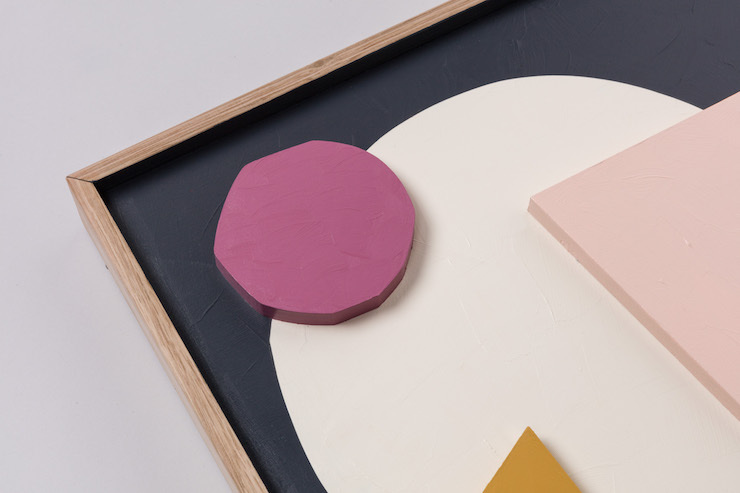 Meditations on colour, form, mindfulness and the visual experience. Spencer Harrison aka Spenceroni is an artist from Australia known for his bold, colourful works. Inspired by his background in science, Spencer draws from the scientific method, building his practice around a methodology of questioning, experimentation and perpetual curiosity. Connecting with modernist movements of the early 1900s, his work explores the boundaries between abstraction, representation, logic and intuition. Developing series based around core ideas but not tied to a single medium, his works venture into painting, sculpture, printmaking and public murals. This series 'no self' is inspired by artist Spencer's mindfulness practice and is an effort to strip back to more simple forms, creating compositions with intricate relationships between form, colour and space. The works extend on the ideas of early 20th century modernist artists, who removed the figure from their work, favouring pure abstraction as their means of expression. By doing so they sought to give the viewer a completely perceptual & emotional experience, free of conceptual analysis. Free from the constraints of representation, my aim for these pieces is for them to act as objects of contemplation; a prompt for the viewer to pause and be absorbed in a visual experience. In Australia, every 3.5 hours someone takes their own life. For every person that does, another 20 people attempt to do so. Interior Stylist Aimee Tarulli (Archer Interiors) and Esther Navarro-Orejon (The Project Agency) together with 27 Australian artists are aiming to open up the conversation surrounding mental health and the stigma associated with the issue by auctioning 27 pieces of original artwork in an online auction starting this Thursday 21st June. The aim is to raise $50,000 for Livin – a mental health initiative educating young people on the importance of mental health, arming them with the tools to tackle mental health challenges. Through Aimee’s personal loss of close friends and the duo’s close relationship with the art world, ‘NoPeace in Quiet’ a charity art auction was developed. 100% of the proceeds from the auction will go to activating the LivinWell program in schools around the country. The national online auction goes live on Thursday 21 June at 7.30pm and concludes on Sunday 1stJuly. The artwork will be available to view over three days at Format Framing, 51-57 Cubitt Street, Cremorne, Victoria. Maegan Brown, a Melbourne-based photographer who documents dramatic landscapes around the globe and is debuting her first solo exhibition 'After—Form' at the ‘Apartment’ by Sisalla Interior Design in South Yarra. Photographed throughout Death Valley National Park and the Mojave Desert in the United States of America, After—Form depicts the isolated, enduring and prehistoric landscapes which were formed more than 150 million years ago, during the age of the dinosaurs. From dramatic canyons to peaceful valleys, Maegan Brown explores celestial terrain, focusing on the relentless and prevailing nature of the vast and expansive environment. Multi-coloured rock formations, geologic textures and fascinating displays of erosion create a conflicting sense of force and calm; everlasting, primitive wilderness. Artist Profile - Kaz Djordjevic... and your chance to WIN! We are so excited to be sharing artist Kaz Djordjevic with you today - her work is absolutely stunning, abstract, vibrant and inspiring... and we know you are going to love it just as much as we do! We were thrilled to have the opportunity to chat with Kaz about what led her to becoming an artist, where she draws her inspiration and what we can expect from her next. - Like Kaz Djordjevic on Facebook here. - Comment the name of which print you would like to win on Dot + Pop's original Facebook post - here and tag a friend! Can you tell us a little about your background – what path led you to becoming an artist? Ironically, it took me many years to pick up a paintbrush and actually just start. 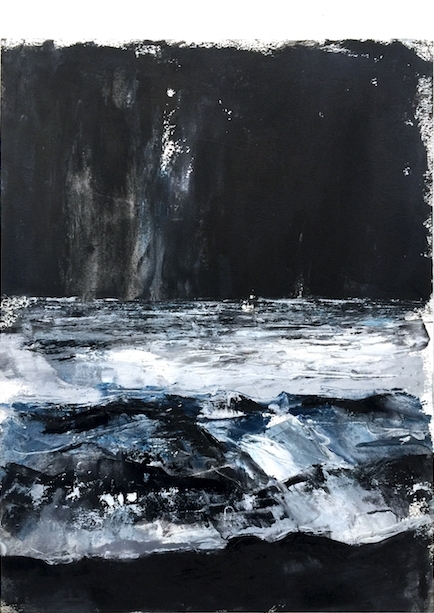 I always had paint, brushes and canvases ready to go in my studio, it was something I really wanted to do, but something was holding me back – and I suddenly realised I kept thinking ‘what will I paint?’ and that's what was actually holding me back. And then time eventually came. I had just left a business and was taking some time out to regroup… it was a beautiful sunny day so I grabbed everything, along with a yum bottle of vino, grabbed one of my favourite albums, cranked the tunes and just went for it! Ta dah! I’m an abstract painter! This actually made great sense. Being completely unrestricted and working in an almost meditative way, using music to guide me was such a liberating process. Being in that in-between place where you’re in a dreamy sub-consciousness, yet so lucid and technical all at once. 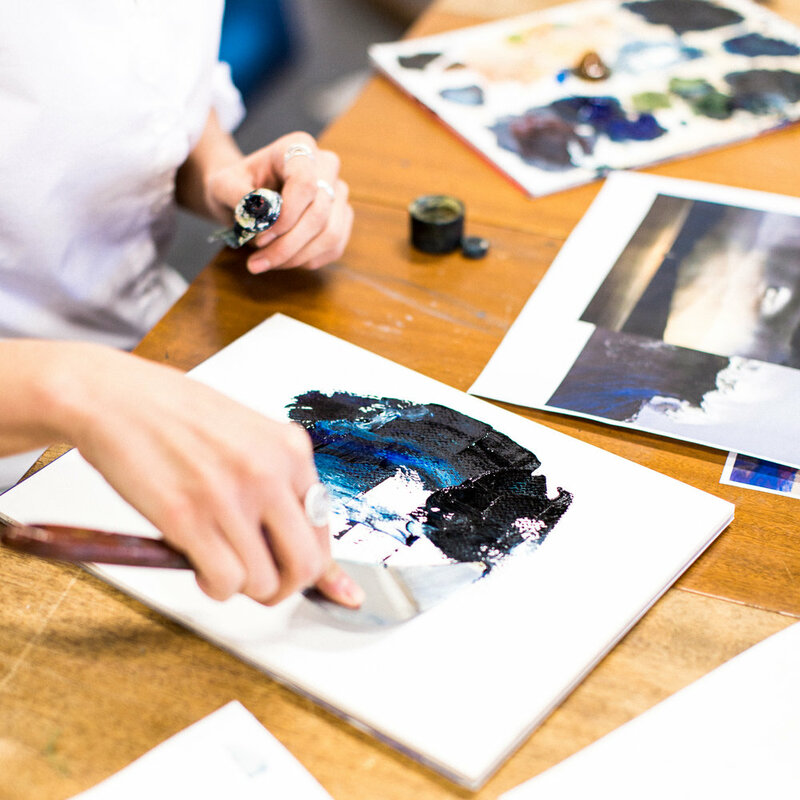 I’ve always been hugely creative and have studied a variety of art forms throughout my life - from being heavily involved in dance from a young age, to studying Art & Design, Fashion & Textiles as well as Photography at RMIT. I’ve always had a huge imagination and a want and a real need to create. Over the past six years I have been painting artworks with every bit of spare time I have, with the intention to explore it further as a potential career path. Painting makes my soul sing; the world suddenly seems a brighter happier place, so I’m going full steam ahead to turn my passion into my lifetime career. Thoughts of having a career as a painter have always rattled around in my head, recognising the lifestyle that could be had really appealed to my sensibilities. It feels like I’ve gone full circle; however that desire to be a true, raw, real artist was always on my peripheral; I feel that being a painter allows this. The universe somehow aligned and made me open up my eyes to this possibility, for me to recognise that I can make a significant contribution as an artist; and in a way that shirks the connotations that being an artist comes with an expectation of struggle. I am very comfortable with what I can produce technically, from life drawings in pencil and charcoal through to intricate surrealist paintings… however my paintings are nothing like that. I don’t want them to be like that. I needed them to be an exploration and to push boundaries, to have freedom and continually surprising the viewer. They are very much about taking a chance and seeing what happens, a discovery and creating a new visual language. With this in mind, their beauty lies in the manner of their unique expressionism style. They are distinct and sophisticated, surprising in their elegance; surprising due to the naivety and rawness maintained of the beautiful organic forms. They are truly individual works of art that are extraordinary, refreshingly real and instantly recognisable as a Kaz Djordjevic artwork. The works really asks the viewer to look at the movement of the paint and expression of colour on the canvas. I often have a giggle as the question “what does it mean?” is raised with me more often than not. I love this challenge and being a bit cheeky as I am, I respond by asking the viewer to breathe, spend some time in front of the piece, really be one with it and then let me know what it means. I’m continually amazed how people connect with the works emotionally and what they draw from the painting. I feel they find their own little ‘dance’ in each piece and I suppose that’s the effect I want them to have; for each person to go away owning the experience in their heart and viewing the world in a slightly different way. Can you tell us about the creative process you go through when painting? That first day I started to paint really harked back to my training as a dancer and a photographer - having to be so technically astute, decisive and surprisingly methodical to actually be able to let go and be free as an artist, free to create. What was most important though, which grew through the many years of training, is the instinct of knowing when to stop. To instinctively trust that your creation is, right now, at it’s best. This forms the basis of everything I do. Time and place is so important for me as I really need to delve and be ‘in the zone’, finding that sweet zen spot where I’m supported by the space I’m in. I have a natural eye for design, so my studio spaces are always beautiful and welcoming with eclectic furniture, lots of plants, plenty of art from other artists, loads of natural light, essential oils burning and great music playing - of course with good set of speakers to assist in cranking the volume. The spaces I work in really appeal to all of my senses allowing me to be in a comfortable, groovy place, where my mind is open and ready to create. I describe my painting process as a dance, using the music to guide me. I’ll listen to the same piece of music, the same album, over and over, working on one painting until it’s finished. I let the music ride over me, absorbing it and harnessing the energy. My works align with a Dadaist philosophy, utilising ‘laws of chance’ in my method and creating works that can never be replicated. The Dada chain of thought is “to destroy the hoaxes of reason and to discover an unreasoned order.” I paint with no plan or expectation and really take this on the Dada approach by starting to work with the paint, grabbing whatever colour is jumping out at me, inline with the energy of my movements - it’s literally a dance with the canvas as I rely on my natural instinct to ‘play’ with the colours, forms and textures as I procure them on the canvas. Every painting is different - I might use big brushes and lay down all over colour, filling up the canvas, or I might throw paint straight at the canvas. I love mixing up colours to create my own palette, it feels like the colours I produce have never existed before; seeing how dragging paint or making marks with random implements or by using my hands unfolds on the canvas. Yep, I’m generally covered in paint from head to toe by the time I finish! Not much changes whether I’m painting indoors or outdoors. I work all my paintings in the round, so I continuously move around them painting, having a groove, noticing how the light hits them, turning them to explore gravity, making paint run to create interesting organic forms. As such there is no correct way to hang my paintings, literally no ‘top edge’ to them. They actually work being hung anyway up, ‘the right way up’ is purely what appeals to you the most. They can look really different depending which way they are hung and I want people to have a play to see what works for their sensibilities. Growing up on stage in a theatrical environment, being around such an array of costumes, stage design, lighting of sets, music scores and dance styles was the starting point. I really understood early on that everything is connected, that art is everywhere, it is part of being human. Growing up in Perth, which is officially the most isolated city in the world, definitely contributed to me having a huge imagination and wanting to learn and explore what the rest of the world is about. Being a child of the 70’s, it was a carefree environment where I’d explore and roam, encouraged to think big and be confident in myself. I’m inquisitive by nature, so I was always dreaming of other places and of creating in anyway, shape or form. When not in the ocean my hours were spent watching art-house movies, being fascinated by exhibitions shown at the Art Gallery WA and losing myself in B&W photography and French and Italian Vogue magazines. My uncle was a hobby artist, abstract also, therefore watching him work and what he would surprise us with next was really exciting for me. I was always trying to get him to stop a painting (even if I had to steal it from him), before he painted over his own brilliant work. There would be achingly beautiful paintings strewn around, absolute and lyrical but by the next day they had vanished, transformed and painted over because what I had seen “wasn’t finished”. This had a really big impact on my appreciation for art and the mastery of being an Artist who can accept their own work for what it is. Gosh, everyday really varies - it depends what stage of ‘the process’ I’m in. I try to set days of the week for particular areas of the business so I can manage everything I need to do without becoming overwhelmed. I really need to be (try to be) methodical as my roles are definitively split between being a creative and business development. I really do need two of me! I tend to paint in blocks of time, so I’ll set aside a week or two so it’s all I need to focus on. Before I start painting it’s imperative to spend some time setting up so everything is at hand to use if I need it or not. Paints, brushes, a variety of implements, lots of cloths and a truckload of drop sheets. Deciding on the music to listen to takes up a big chunk of time too. Some days can turn out to be totally messy, so I have to preempt the disasters that can easily happen with oil paint. The actuality of my everyday as I begin is to straight away put on some great tunes, burn essential oils to make my space lovely to get into the day - setting the stage somewhat. I’m never in a rush in the morning, taking time to become focused, I really give each day the respect it deserves. I’m not subscribing to the ‘rat race’ and usually find myself driving against traffic which gives me great pleasure. The most important thing as I work on my own is to not go stir crazy! So with this in mind I make sure to be actively networking, meeting other entrepreneurs and refreshing my brain and soul with a little cruisy afternoon bike ride around my hood. I’m also doing Pilates and Yin Yoga each week to balance myself, reconnect to the present and keep my body and mind healthy. Running your own business is really challenging and always being on the go can quickly take it’s toll. Pretty much every day finishes with cooking a beautiful meal (I’m quite a foodie), matched with a fabulously appropriate vino and relaxing with my love. My partner is a chef but he doesn’t get to cook at home. It’s really a win win situation, as I liken cooking to being my meditation and I get to spoil him at the same time after his long hours in the kitchen. Inspiration is everywhere - I might see a flicker of light or a play of a shadow, it could be an interaction with an animal, a photograph, an artwork, walking into an amazing space or something humorous that makes me laugh out loud… if it piques my interest it’s mentally filed away. It could really be anything but it is music that makes it all happen. Next I'll be launching a collection of luxury scarves in cashmere and silk. They will feature my paintings reworked as textile designs therefore creating a new dimension of my works. The scarves are a gorgeous quality, holding my designs well as wearable art. With Kaz Djordjevic Studio I want to push the boundaries of re-imagining existing items as modern products that are relative to this era. I’m really gagging to start to conceptualise the photographic campaign around this and can’t wait to photograph the range creating timeless and jaw dropping imagery. As a brand I’ll be researching and developing home and lifestyle products with a huge focus on sustainability and innovation. I will be making items that you will have for many years that won’t be disposable, stunning pieces that you will have in your personal space or that will be functional for your everyday. Outside of that I’ll keep on painting and creating more original works to exhibit as I’m aiming to have an exhibition within the next 12 months. With those works I’ll continue to expand on my limited edition print and scarf range, I'm hoping to have quite an interactive affair when I do pull the exhibition together. It would be lovely to start looking at doing some commissions too, so that will also be on my list of things to do. Biggest ‘pinch me’ moment so far? I sometimes will receive emails from people who have come across my work to let me know how much they love it. This is the best ‘pinch me’ moment. It’s unfiltered and real and it melts my heart that they have taken the time just to let me know. It’s these moments that keep me pushing forward to follow my passions. Who are your favourite artists / designers / architects at the moment? I really adore a lot of Indigenous artworks, finding each artist so distinct and different than the next – a lot of the work I’ve seen really blows my brain. The influence of place is remarkable. I find the more contemporary artists really interesting in the sense that they are creating their own stories rather that purely painting the stories that have been passed down through generations. I’ve had the opportunity to work with a handful of contemporary Indigenous artists and have had the experience of seeing artworks being created and hearing their stories which is beautifully grounding.I have very eclectic tastes, hence I’m always defending myself in the fact that I don’t have favourites. In anything. I love, enjoy and celebrate so many different aspects that I generally find something intriguing with most spaces, designs, artworks and well, things. I’m a big fan of ‘clever’ design that unashamedly sets it’s own style. So for me architecturally speaking I’ve always been a fan of the aesthetics of Architects like Frank Loyd-Wright and Gaudi who have an almost surreal integration, whilst creating a connection to the natural environment. I greatly admire designers such as Karl Lagerfeld and Viktor & Rolf who create over so many mediums – very much like myself. Do you have any upcoming exhibitions or collections coming out? I’m planning to exhibit within the year, however just needing to find the right space to do so. I’ve conceptualised a fantastic experience for the exhibition (which I’m keeping under wraps). So on that note, if anyone would like to attend the launch, please subscribe through my website to join‘Art Lovers’ for updates and an invite when the time comes. If anyone is reading this who has a fab space to house a fab exhibition… then please call me right now! In the meantime, keep your eyes peeled in the coming months for the launch of my wearable art scarf range. Signed and titled by the Artist. Title and signature is handwritten and embossed Artist’s seal are placed in the white border on the front of all prints. Limited edition of 25 or 50. Embossed with Artist’s seal. The artist 'seal' will always feature as embossing on the lower edge as an assurance of authenticity. Printing is always on to the highest quality papers available. Digitally giclée printing onto 100% cotton rag matt paper. This is museum quality paper that is an uncoated, acid and lignin free certified archival paper with a 85 year guarantee for image stability. Printed with Epson UltraChrome™ K3 archival inks. Framing is not included, all prints will require framing on arrival. Paper prints have a white border added to the actual image size for handling & framing. Kaz Djordjevic limited editions are available exclusively direct from the Artist. Production runs are tightly controlled and are strictly limited to the number in the edition. All prints are handcrafted by expert fine art printers in Melbourne, using premium museum grade parchment and archival inks - presenting an exceptional depth of true colour and rendering of fine detail with the highest image stability available. This giveaway is in no way sponsored, endorsed or administered by, or associated with Facebook. The Winner will be picked at random on Sunday 20th August 2017 at 10pm. Winner will be notified on Facebook and will need to contact Kaz Djordjevic Studio directly to claim their giveaway prize. We love art and Sydney's latest art gallery offering has us super excited! 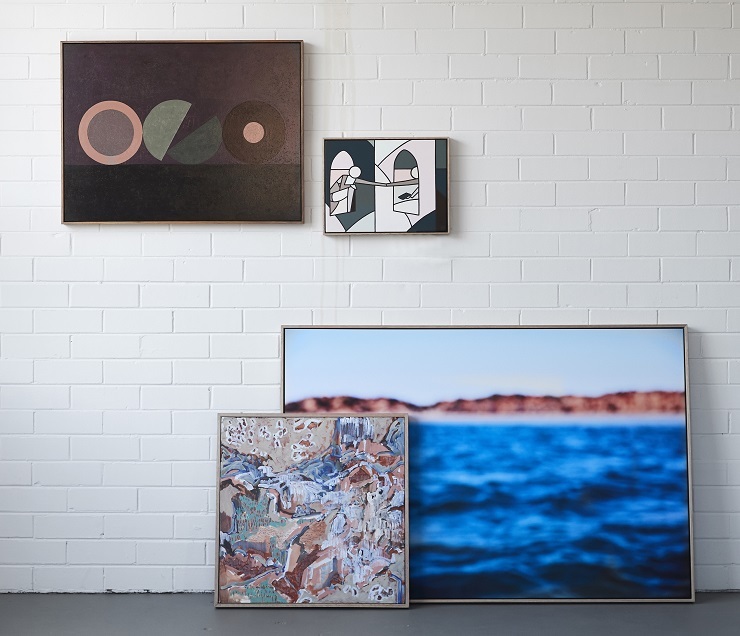 A collective of 13 Sydney artists have recently opened a new gallery space, ‘Sydney Road Gallery’ on 7 June in Seaforth which disrupts the traditional gallery model of showcasing and selling artworks. The collective are accomplished mid-level exhibiting visual artists from disciplines including painting, printmaking, textiles and sculptural basketry, who have come together to jointly open and manage a combined gallery space. Sydney Road Gallery objective is to create a business around relationships: artists with artists, artists with customers and artists with stylists and interior designers. The gallery will feature a diversity of artwork that will inspire and appeal to interior designers and art lovers alike, including paintings, textiles, sculptural and wall hanging pieces to suit different tastes, themes and settings. The works will change every two weeks. Alan Walsh is a dapper Yorkshireman and internationally acclaimed artist who continues ‘to blow doors right off’ with his use of light and primary colours. His style is accessible, vivaciousness and brings a certain vibrancy to any canvas. Due to his father's job designing racing cars, Alan spent his childhood weekends travelling to exotic destinations such as Monaco, Monza and Silverstone. To keep him entertained on these long journeys Alan would sit with a pencil case and paper, and sketch the glamour and decadence of this grand life. By his early 20’s Alan had already created an impressive portfolio, designing and illustrating for many leading branding agencies both in the UK, US and Australia. In 2010 he left the branding world behind, making the decision to focus solely on his art and exhibit around the Globe. That he certainly did, excelling with solo Exhibitions in Los Angeles, San Francisco, Paris, London and a sell-out Tour de France show while also owning his own Sydney gallery for 3 years. Since then, it’s no coincidence that prestigious commissions have followed, for the likes of London Fashion Week, Mercedes Benz, Tag Heuer Watches, Tour De France, Grey Goose Vodka, Coca Cola, Neverfail Spring Water and The Royal Flying Doctors. His work has become iconic, earning him front covers of art house magazines and has been compared to other greats who ‘blew the doors off’, such as Andy Warhol and Fellow Yorkshire man David Hockney. Today, with Alan’s hands-on approach, the brand continues to flourish and evolve. He travels the world to immerse himself in different cultures and people from all corners of the globe, fuelling his creativity with things seen and felt and imagined. A moment of withering beauty caught in an instant and revealed forever in expansive detail. Isamu Sawa’s striking macro photographic images of dying flowers are proof that the art of master photographic craftsmanship is, in fact, not dead. Sawa’s new series confirms that technical brilliance, years of experience and a great eye still count. Sawa first plucked a discarded flower from his florist wife’s studio intending to embark on a technical exercise. He used a process called focus stacking, taking up to 25 close-up or macro images with graduating depths of field and then combined them with complicated software to produce a single image in crisp, uniform focus. With encouragement from a friend he enlarged a single colour print and was immediately aware he had produced something special. Sawa’s treatment of these withering flowers – just days or weeks after they featured in wedding ceremonies around the country – make them even more breathtaking and special. It is a slow, painstaking and complex process. Born in Japan and raised in Australia, Isamu Sawa has been a commercial photographer for more than 20 years. With a reputation for technical ability and a keen eye for composition he has worked for a host of commercial and editorial clients, including Holden, Mercedes Benz, Subaru, Domaine Chandon, Jack Daniel’s, Penfolds, GQ, The Age Melbourne Magazine and Vogue. He has also photographed well known identities including fashion designer Jean Paul Gaultier, actor Geoffrey Rush and former prime minister Kevin Rudd. Known to friends simply as ‘Issey’ he lives in Melbourne, Australia, with his wife Basia and their baby daughter, Hannah Rose. 'MALACHI' by Jai Vasicek is named after Jai's father's boat and has had Jai re-visiting his childhood, which encompasses boat life from Brazil to Africa, tropical fruits and treasure chest surrounds. His current exhibition is being housed at Fenton & Fenton in High St, Prahran. "His designs feature vibrant colour with layers of print and patterns inspired by the sea and forest, with exotic creatures, feather and shell adornments, bold motifs, religious iconography and evocative female forms from polynesian beauties to ocean sirens. Splashes of neon and bright colours and the raw textures of resins and grouting bring every piece to life, making them a truly unique style statement." His highly sought after crosses and wall tiles have colour and energy which look gorgeous standing alone or in a group on the wall. As well as selling his renowned Art pieces in leading stores nationally and online, Jai has created an amazing store, Ahoy Trader in Byron Bay, NSW; the store is a collection of his own work along side homewares and fashion from local and Australian designers who share a similar aesthetic.